The 16-year-old victim is still in hospital with a chest wound after the attack in Gilmerton yesterday afternoon. 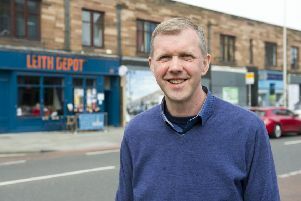 He was attacked at about 5.10pm and found lying on the pavement outside the Aldi supermarket on Gilmerton Road. 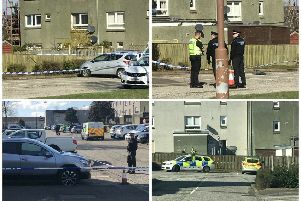 A police spokeswoman said: “Police in Edinburgh are investigating following an attempted murder in the Gilmerton area. “A 16-year-old boy suffered serious injuries to his chest and was taken to the Edinburgh Royal Infirmary by the Scottish Ambulance Service where he remains receiving treatment. The attack happened in front of horrified shoppers. Eye-witness William Hill told the Evening News: “Everyone rushed to the boy and I think one woman was an off duty nurse. She was screaming for bandages and scissors. “It was pandemonium. The youth was just lying on the pavement and had a stab wound on his side fighting for his life. Anyone with information can contact Gayfield CID via 101, quoting incident number 2957 of 14 April.